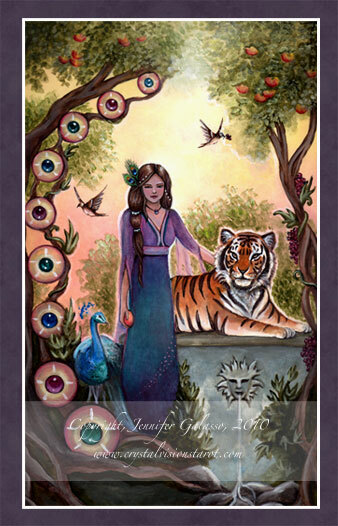 Today's Draw Classic*: The Nine of Pentacles from the Crystal Visions Tarot. How much of what/who you are today was visualized long ago? How much of what you are came as a surprise development? And how does it all come together to help define your mission in life? The Nine of Pentacles usually pictures a woman and speaks of someone who is self-sufficient and appreciates the finer things in life. The lwb for this deck says she has tamed the wild part of her (thus, the tiger) and has built the life she visualized for herself. This got me thinking about what I've visualized for myself over the years. Even as a little girl, I never wanted to be married. And I always wanted to be around dogs. At first I wanted to be a veterinarian, but as a grew older and my talents made themselves known, my desires moved more toward a career in the arts, first as an actress, then as an advertising copywriter. So today, I'm a single doggie mom who writes advertising for a living. I remember when I was young, passions and interests would come and go. The same is true of me as an adult. I cook, sew, do stained glass, craft, create and pursue all manner of artistic endeavors. But only writing has stuck with me as an ongoing passion that permeates my life. I can't imagine doing anything else. I believe I would be terribly unhappy earning a living any other way. In fact I was so unhappy the first three years of my professional life doing other things in advertising agencies, that I found a way to freelance and build a portfolio in my off hours. But as I was thinking about all the stuff I visualized that came true in my life...my writing, the dogs, the singledom...I also thought about stuff that happened in my life that I never saw coming. For example, I never saw myself being self-employed, though my early foray into freelancing (along with my rabid independence) should have been a clue. And I also NEVER saw myself becoming a spiritual writer or a tarotist. And now those things are essential parts of my life. Heck, growing up I was not only "shielded" from religion, I considered myself an atheist. Now I embrace all gods. And I didn't even know what tarot was growing up. In retrospect, of course, I can see how it makes sense...introspective, day-dreamy girl and all. But the whole spirituality thing wasn't something I ever visualized for myself. It just happened. And the "just happening" part of it has entirely reshaped my life and everything in it. I could still be a copywriter and doggie mommy without it, but it has opened a new path for visualization that I know will serve the second half of my professional life well. And I don't mean to say that everything we are today had to have been visualized in adolescence or whatever. It's just that I never visualized the spirituality stuff coming into my life—AT ALL. There didn't even seem to be a basis for it the way I was raised. It was a complete surprise development. And now it has sparked a whole new set of visualizations. And it has also changed something so deep in me that I would characterize it as changing my DNA. It feels like, outside of my creativity, intelligence level and sense of humor, I'm almost unrecognizable in relation to who I was when I first started visualizing a life. Even my hair color and eye color are different...haha. Honestly. I went from blond as a teen to auburn blond in my 20s/30s and now I'm more brownish. And my eyes changed from blue to green when I was about 30. So all of this makes me wonder. I define my mission in life as "healing people with my words" or "moving people with my words". But part of the means to do that came from something I never visualized for myself—the spirituality. And part of it came from something I pretty much always knew was ingrained in me—the writing. If it's why I came here, why didn't I see it sooner? And if a surprise development was the missing link to having/finding purpose in my life, what might still be hiding itself within you?